So. Very late, even later with updating - this isn't going well this year either, but at least I've managed to finish four challenges. This should have been done in April, but in April Fairweather manor got in between and then there was the white outfit for Dramaten and then it all went pear-shaped. The pattern's very straight forward, it's the basic shirt in Tudor tailor, sliightly altered to fit a slightly taller person. I was a bit short of time before the event, so I cheated and made the long seams by machine, then added the gussets in the side and shoulders as well as collar, cuffs and hem by hand. The seams are felled by hand to make the machine-sewing at least less visible. Ties for closing cuff and collar were finger-braided in linen/cotton yarn, which was the best I could find at the time. 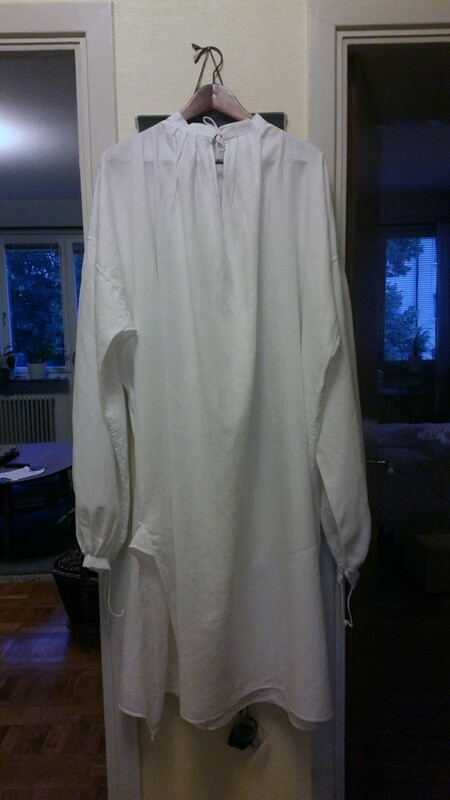 No WIP-photos and sadly no photo of it worn, but here it is during the like five minutes it was ironed and unwrinkled before being packed. Notions: Linen/cotton yarn, linen thread for handsewing. How historically accurate is it? : 90% - machine sewing with polyester thread aside. It'd pass I guess! Though a real Tudor would likely cry at the poor quality linen we get nowadays. Hours to complete: Don't know? 10-15 perhaps. Total cost: Stash used, so didn't really keep track. It was JUST enough of my white linen (I used about 2 metres, I think).